Parents who "vape" should be aware that a very small amount of the liquid nicotine used to refill e-cigarettes can kill a child. The liquid also can be poisonous within a matter of minutes if spilled on the skin. A 1-year-old child died from liquid nicotine poisoning in December 2014— the first such death in the United States. The number of calls to poison control centers about liquid nicotine has shot up significantly in recent years. There were 2,452 calls about exposures as of September 30, 2015—many more than the 1,543 exposures reported in 2013. "These (refills) are being sold in hundreds of different flavors, including flavors and colors that would be absolutely appealing to kids," said Kyran Quinlan, M.D., M.P.H., FAAP, chair of the American Academy of Pediatrics (AAP) Council on Injury, Violence and Poison Prevention. "It's such a small quantity and yet it's so toxic and so deadly. I don't think (people) realize what a deadly toxin they have in their house when they have liquid nicotine." Children ages 1-2 years are at the greatest risk of getting into the product, but parents of children under age 5 should be especially cautious. As of 2016, the federal government requires liquid nicotine to be sold in childproof packaging. The American Academy of Pediatrics (AAP) urges parents who use e-cigarettes to store the products and any refill materials in child-resistant packaging and out of the reach of children. "There are three routes of exposure that (are toxic to) children. If they put it in their mouth even without swallowing it will be absorbed into the mucous membranes, just like nicotine gum. If they swallow, it will be absorbed in the intestinal tract. If they spill it on their skin, it's absorbed through the skin just like a nicotine patch," said Dr. Quinlan. The bottles are sold in various sizes, from 10 milliliters (about 2 teaspoons) to more than 30 milliliters (about 6 teaspoons) and come in a variety of nicotine strengths. A teaspoon of concentrated liquid nicotine can be fatal for the average 26-pound toddler. 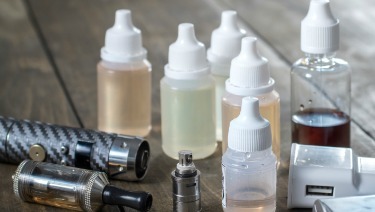 If you suspect your child was exposed to liquid nicotine that was spilled on the skin or swallowed, call the Poison Center hotline: 800-222-1222 immediately.